Polyester is a well-known fiber in the synthetic fibers because it has certain desirable properties, the properties are high strength, wash& wear property, good dimensional stability, elegant appearance and suitability for blending with cellulosic and protein fibers. But Polyester has some certain drawbacks such as low moisture regain, creating static electricity, and soiling problem, difficult to dye. Thus, modified Polyester is prepared to overcome these disadvantages as they are interrelated and associated with the hydrophobicity of the Polyester. Therefore, a hydrophilic fiber will have a higher moisture regain. The garments made up of hydrophilic fiber will absorb perspiration and will be comfortable. Various approaches used in the modification of Polyester fabrics, modifying agents used, and application of the modified products based on the properties obtained have been investigated [1-4]. Numerous research papers and patents are available and considerable amount of research works is in progress on the hydrolysis and aminolysis of Polyester fibers to overcome hydrophobic property. Improved moisture absorbency of Polyester fibers can be achieved by introducing hydrophilic block copolymers. However, this modification can lead to problems of longer drying time, excessive wrinkling, and wet cling . Masuduz Zaman, et al. studied the Polyester fabric modification by applying a hydrophilic surface ﬁnishing agent that contains Nano Crystalline Cellulose (NCC) to impart superior hydrophilicity. NCC was further catatonically modiﬁed through quaternization by grafting glycidyl tri-methylammonium chloride. Furthermore, the cationic textile surface ﬁnish was capable of withstanding multiple washing cycles . 1. Change in the chemical composition of the PET molecule by introducing a third and/or fourth component into the polymer chain during polymerization. 2. Use of certain additives in the melt phase prior to extrusion. 3. Modification during melt spinning such as hollow varied profile and micro-denier fibers for specific applications. 4. Surface modification of normal Polyester fiber for producing specific effects. The aqueous mixtures with the optimal mass ratios of urea, thiourea, and NaOH, reported in the literature , were used as solvent systems in this study. Shenai  studied treatment of Polyester fabric with a mixture of 0.3% sodium hydroxide in ethanol, squeezed to 50% pick up and then stored after covering it with a nylon film at room temperature for 24 hours. There was a loss in weight of 21% of treated fabric and the fabric achieved uniform silk-like handle. Bendak  indicated that chemical degradation of Polyester fibers is caused by methanolic sodium hydroxide solutions treatment. Methanolic medium and higher temperature of treatment resulted in a steeper tendency in the loss in weight, which had lost about 5-8% of their original weight. Achwal  found that for a satisfactory improvement in feel to a silk-like level, a high weight loss of 15% was necessary. Adequate improvement in hydrophilicity could be achieved by a weight loss of 5%. Air permeability relates to so called fabric porosity. Fabric porosity depends generally on the fabric and yarns constructions. Permeability measurements for porous fabrics are influenced by strain, humidity, airflow rate, and fabric elasticity . Several researchers studied the relation between permeability and porosity of fabric and predicted fabric air permeability practically and theoretically [12-16]. In this work, the Polyester fabric has been coated using a cellulose solvent of NaOH/urea/thiourea aqueous solution. The effect of cellulose solution coating percentage has been studied on fabric wettability, water wicking, stiffness, and air permeability. A woven plain Polyester fabric was used with Ends/cm and picks/cm are 21 and weight fabric 132 g/m2. The weft and warp are made of polyester spun yarns. Cellulose solutions, used in this study, was prepared from viscose fibers of count 1.6 dtex and length 40 mm and supplied by Spolan Inc. For tri-component solution, the concentration of each component was expressed as x/y/z NaOH/urea/thiourea representing by (x) wt% of NaOH, (y) wt% of urea, and z wt% of thiourea. It was found that there are the aqueous mixtures with the optimal mass ratios of urea, thiourea and NaOH , and the solubility of 7% cellulose in 8/8/6.5 NaOH/urea/thiourea aqueous improved significantly with increasing NaOH concentrations and peaked at 8% NaOH with solubility 91%. For aqueous NaOH/ urea/thiourea systems, the solvents were pre-cooled to −12 to −10°C for 10 min before cellulose was added. In aqueous 8/8/6.5 NaOH/urea/thiourea, cellulose was dispersed after the solvent was pre-cooled to −10°C. Cellulose solution was stored in the refrigerator for 1 hour at -5°C followed by vigorously stirring for 3 min. The solution temperature was then maintained between −2 to 0°C using a salt–ice bath and the mixture was vigorously stirred for 7 min to obtain transparent cellulose dope. All prepared cellulose dopes were subjected to centrifugation at 5000 rpm in order to exclude the minute amount of not dissolved cellulose and to help degasify. ATR-FTIR studies: The surface chemical analysis of coated cellulose samples was carried by attenuated total reflectance (ATR-FTIR) spectroscopy on ATR method (crystal Ge), Nicolet iZ10. SEM study: The SEM photomicrographs using a model ZEISS to study the changes in the surface morphology of treated samples with different cellulose concentration. Air permeability: The air permeability of the Polyester fabrics was measured using an METEFEM tester, type FF12/A, according to the British Standard BS 5636:1990. The result of the evaluation of the air permeability expressed as air flow R, was recorded in mm/sec, in which a smaller value of R indicates poor air permeability of the fabric and vice versa. N: No. of fabric layers. Fabric stiffness test: TH-7 Stiffness Tester measures the force required to bend a wide variety of flat materials under controlled and repeatable conditions. The method of measuring on TH-7 has been described by Fridrichov . The range of the measuring force of bending the samples is from 40 to 4000 mN. TH-7 Stiffness Tester provides fast and accurate measurements. The point, when the sample releases, was automatically recorded by an optical encoder and displayed on a digital read out. Both the right and left direction was recorded and automatically drown the profile of fabric stiffness. Absorption zone: The wicking capacity of the fabric was investigated from the absorption zone. Test specimens were conditioned at RH65%and 27°C temperature for 24 hr. Absorption area was calculated for different samples. The fabric sample was placed on a horizontal base net plate and then the absorption area of water drop was measured. Measurements were carried out using six duplicate absorption areas to ensure repeatability. Capillary rise method: The rate of vertical capillary rise in cellulosic treated samples was measured using pigment solution to test vertical capillary rise with a fabric sample of dimensions (7 cm × 1.5 cm). Tested specimens were conditioned at RH 65%and 27°C temperature for 24 hr. Then specimens were suspended vertically in the liquid. The rise in wicking heights for predetermined times were recorded. Measurements of the wicking heights were carried out using quintuplicate samples to ensure repeatability. In this work, the height of the capillary rise of liquid was measured after 300 sec. with intervals of 30 sec. Where mk and mn are the mass of dry test piece and the mass of the test piece and absorbed liquid after immersion in distilled water respectively. In this work, the measurement of the liquid absorptive capacity was carried out using three sample, (2 cm × 4 cm), for each treating. Absorption time was selected to be 120 s at temperature 22°C. The samples were then hanged 120 sec in extended form attracted water was measured. The Solubility of cellulose in aqueous NaOH/Thiourea/Urea solvent was used for the treatment of woven Polyester fabric. The solutions for different cellulose concentration were sprayed on fabric samples of size 17 cm × 17 cm, followed by neutralization with acetic acid 10% to precipitate cellulose. Treated samples were washed with water and dried for 10 min at 110°C. Table 1 gives the different experimental conditions of the samples. Table 1. The experimental conditions. The aim of this work was to investigate the how the coating of the polyester fabric with a cellulosic coat in small percentage in the range of 1 to 10 percentage will affect some physical and mechanical properties as. Figure 1: Dimensions of unit cell of plain weave. Where p1 is two successive warp yarns distance [mm], p2 is two successive weft yarns distance [mm], d2 is the warp yarn diameter [mm], d1 is the weft yarn diameter [mm]. 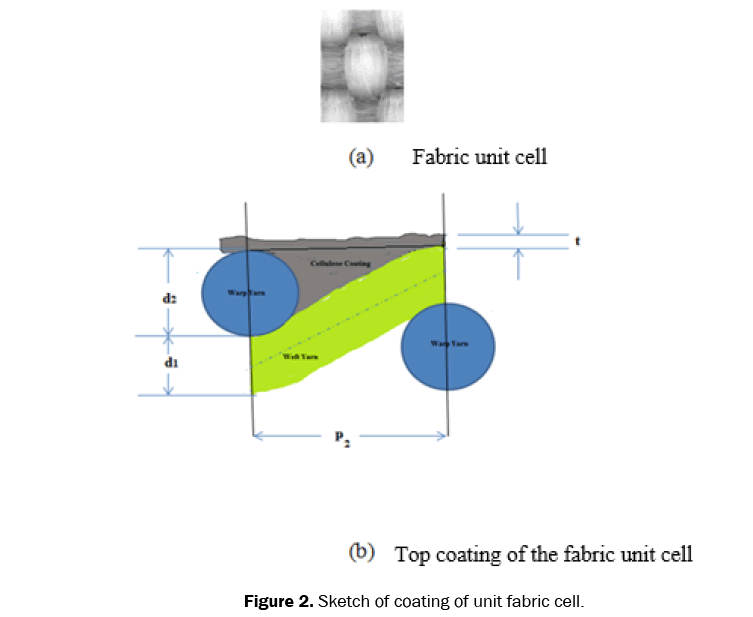 Figure 2: Sketch of coating of unit fabric cell. ρ is the coat material density [g/cm3]. Figure 2 shows the sketch of unit fabric cell. Table 1 gives the theoretical value of the thickness of the cellulose coating in different conditions. In this case it is important to mention that the spraying method will affect the value of the average thickness and the actual air permeability and porosity will affected too. 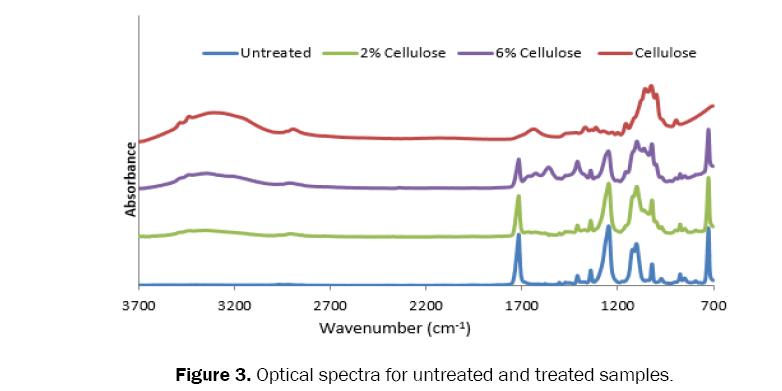 Figure 3: Optical spectra for untreated and treated samples. ATR spectra at 3293 cm-1 can be OH group which was added after treatment with cellulose solution. Results indicate that imparting functional group on the surface leads to enhance hydrophilic properties. At 888 cm-1, it can be alkenes, increasing with increasing cellulose percent. The peaks appearing in ATR spectra at 1713 and 1249 cm-1 can be attributed to the polyester component which decreases gradually with increasing cellulose composition. SEM images of untreated and treated sample show also a noticeable marked difference in surface morphology of the fibers. The treatments of the fabric with the addition of cellulose coating change of fiber surface, as well as well as the fabric morphology. The alterations in surface morphology impart rise to hydrophilic characteristics of the fabric surface. The investigation of SEM of the different samples shows clearly a film of cellulose adhere on the fiber surface, its thickness depends on the percentage of the spread cellulose i.e. at 6% cellulose thicker uniform layer as shown in Figure 4. The non-uniformity of thickness is due to the uneven by hand laying of the cellulose film. Figure 4: SEM of the different treated and untreated fibers and fabrics with different cellulose concentrations. Figure 5: Air permeability versus cellulose coating% on the fabric surface. 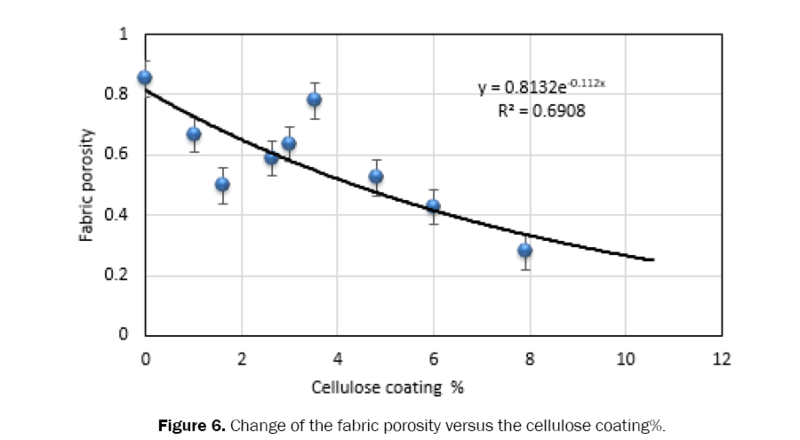 Figure 6: Change of the fabric porosity versus the cellulose coating%. Where m number of pores, Ap area of pores, Af area of fabric. There is a high positive correlation between the air permeability and porosity [12,13,16]. Figure 7 shows that as the cellulose coating% is increased, the film thickness increases which leads to decrease in the air permeability as a result in decrease in fabric area of pores. Hence the porosity of the coated fabric by cellulose will be reduced as shown in Figures 5 and 6. Figure 7 shows the change of the air permeability as a function of the theoretical cellulose coating thickness while Figure 8 illustrates the variation of the porosity as a function of the thickness of cellulose coating. 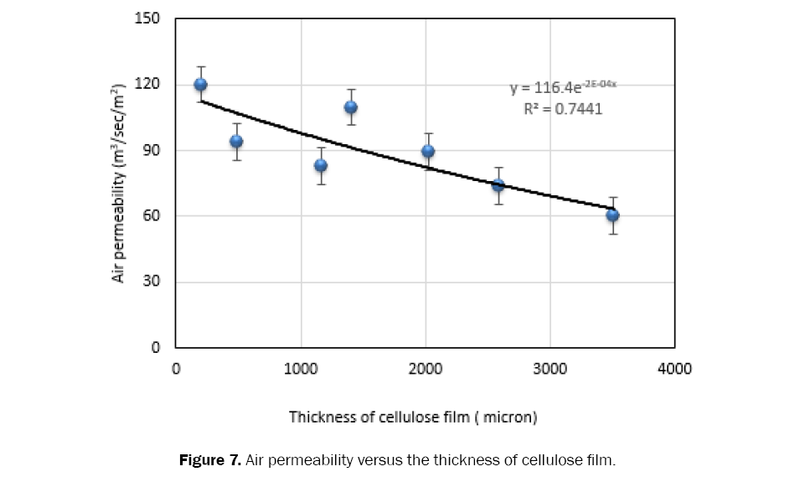 Figure 7: Air permeability versus the thickness of cellulose film. 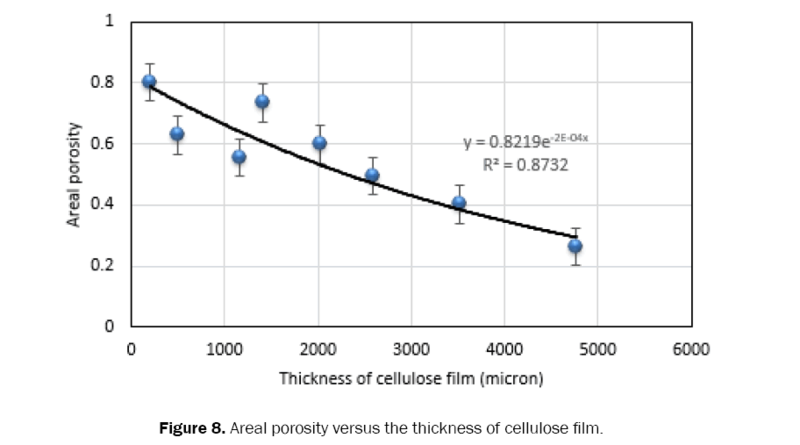 Figure 8: Areal porosity versus the thickness of cellulose film. 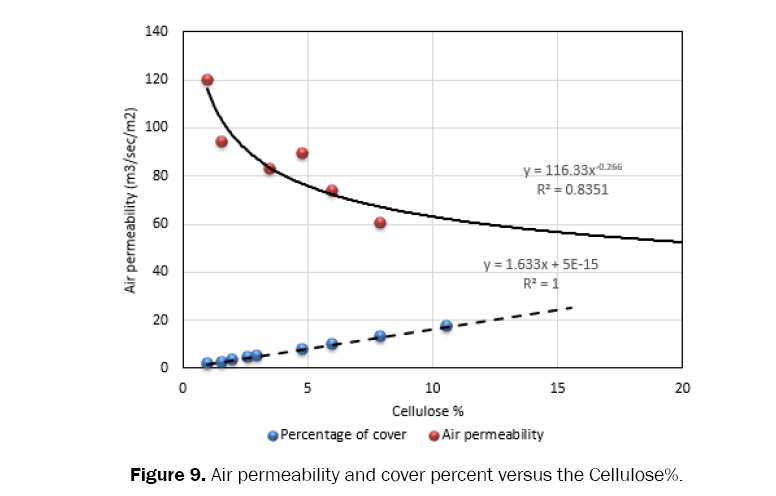 Figure 9: Air permeability and cover percent versus the Cellulose%. 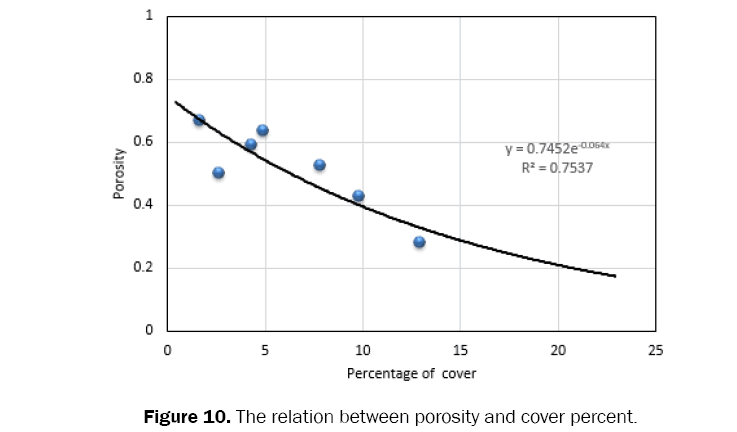 Figure 10: The relation between porosity and cover percent. The stiffness of the fabric affects greatly on the fabric drape ability and consequently the comfort, hence the bending properties have important effects on both handle and tailoring the performance of the fabric . The output from the device is the value of bending force Fm [mN]. This value can be measured for various sample widths, with 50mm being the maximum and the minimum being unlimited. The suggested length of the sample is 50 mm. Figure 11 shows the scheme of bending the fabric on device TH-7 . The sample on device TH-7 is clamped only into one jaw, while the other end goes through the sensor jaw. The highest value of the bending moment acted at the point where the sample is clamped; however, at the point of the sensor jaw, the value of the bending moment equals zero. The output value from device TH-7 is bending force Fm. Where K=0.604 for samples of 2.5 cm width. Fm is the bending force [mN]. It is dedicated that bending rigidity Bs for sample of width s. or the bending rigidity of unit width B=Bs/s. The effect of the fabric coating on the fabric stiffness was studied. Figure 12 shows bending force of treated samples with different cellulose (%) while Figure 13 illustrates the effect of the coating thickness on the fabric bending force. Figure 12: Bending force versus the Cellulose (%) on the fabric surface. 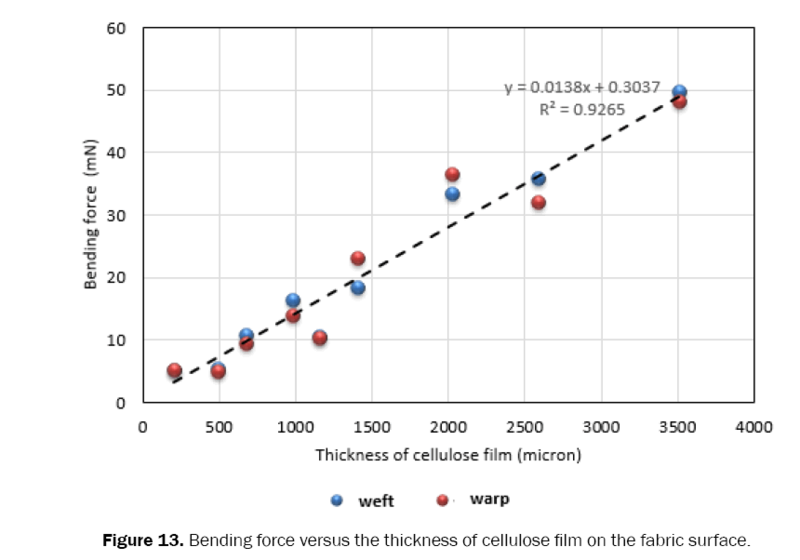 Figure 13: Bending force versus the thickness of cellulose film on the fabric surface. It can be concluded that as the cellulose percentage is increased, there is a remarkable increase in the bending force and consequently, the bending rigidity in both warp and weft directions as s shown in Figures 14 and 15. Therefore, when the fabric is coated with cellulose film, it becomes much stiffer. 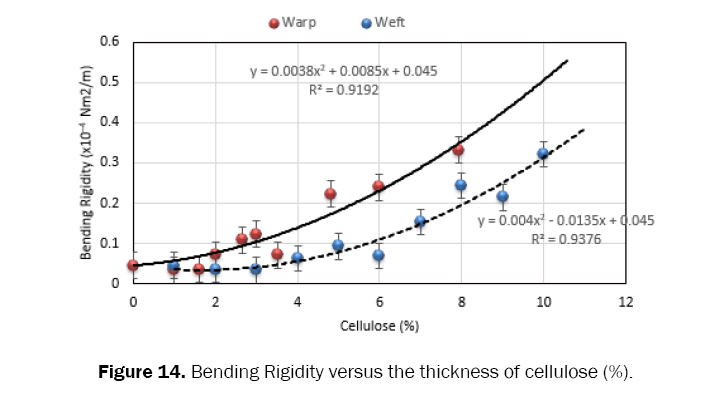 Figure 14: Bending Rigidity versus the thickness of cellulose (%). Figure 15: Bending Rigidity versus the thickness of cellulose film on the fabric surface. The fabric wettability can be defined by several parameters such as spreading area, vertical wickability and percentage of water absorption. The spreading area method provides information on both, absorption and in-plane wicking properties, simultaneously . The liquid that penetrates fabric can be taken into two directions. The first direction is the capillary space between the fibers and the second direction is between fibers where the cellulose coating is penetrated where the absorption will take place hence the water spread on an increased area. The percentage of sprayed cellulosic reduces the area of water spreading, due to the increase in the percentage of cellulosic layers penetrated in the fabric pores as shown in Figure 16. Figure 16: Spreading area versus thickness of cellulose film on the fabric surface. The wettability of solid surfaces is governed by both the chemical composition and geometrical microstructure of the surface , the capillary of the material the narrower the capillary diameter the higher the height recorded. In the meantime, the highly absorbent material gives lower wickability . So that increases of the sprayed cellulose (%) coating lead to more water absorption resulting in less height. This results in less capillary spaces and less wicking speed  and higher absorption. The two factors are opposing each other the case where more capillary increases the height while the higher percentage of cellulose reduce the wicking height. Figure 17 shows that the treated sample with high percentage of cellulose coating gives less wicking rate which conscience with the findings of several published research [22,23]. Saville  reported that when wicking takes place in a material whose fibers can absorb liquid the fibers may swell as the liquid is taken up, so reducing the capillary spaces between fibers, potentially altering the rate of wicking. 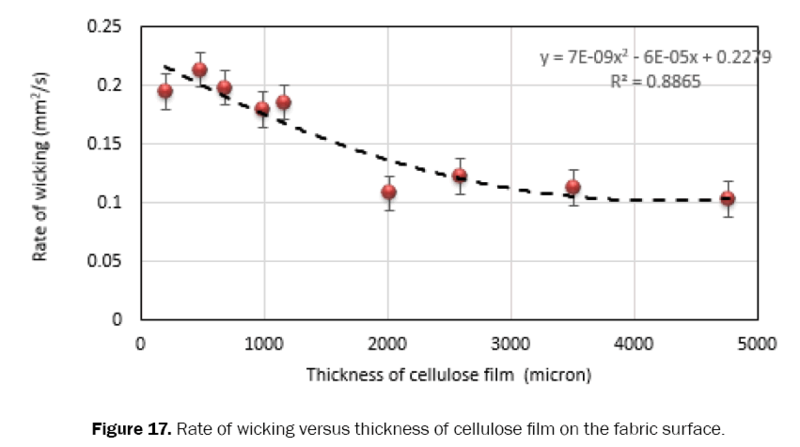 Figure 17: Rate of wicking versus thickness of cellulose film on the fabric surface. Another parameter which affects the fabric absorption properties is the porosity of the fabric. 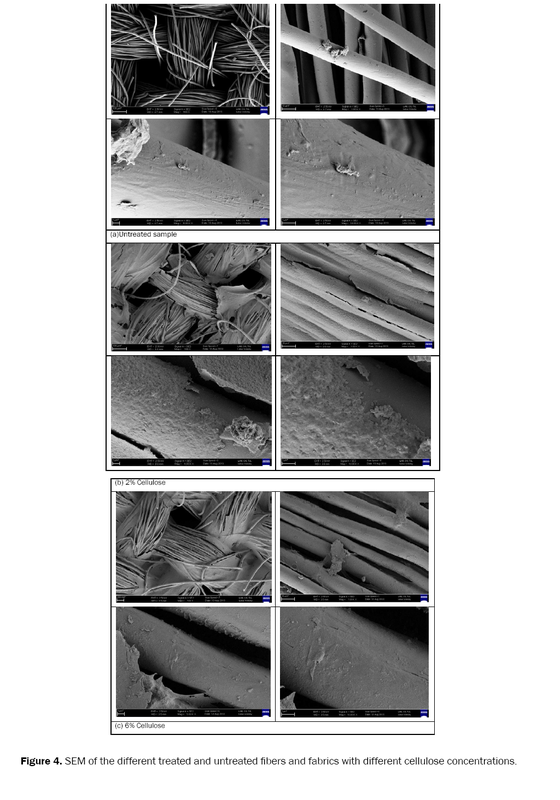 As shown in SEM of the fabric indicates the cellulose coating covers some of the pores between yarns and hence additional cellulose film will absorb more liquid reducing the spreading area and the vertical wickability. The interaction between the above two factors and the rate of wicking will break the reduction of the rate of wicking as percentage of the cellulose coating increases. The absorbency of the material increases with the increased hydrophilicity of the material. Figure 18 indicate that the increase of cellulose (%) leads to reduce liquid absorbency due to blocking all pores of the fabric as results of cellulose film. Therefore, in the case of cellulose treated, only the cellulose film on the surface is responsible for absorbency. In the same time, the rate of water loss will increase for the untreated samples. The structure of untreated sample, which has higher air permeability values, might lead to evaporate the water so quickly . 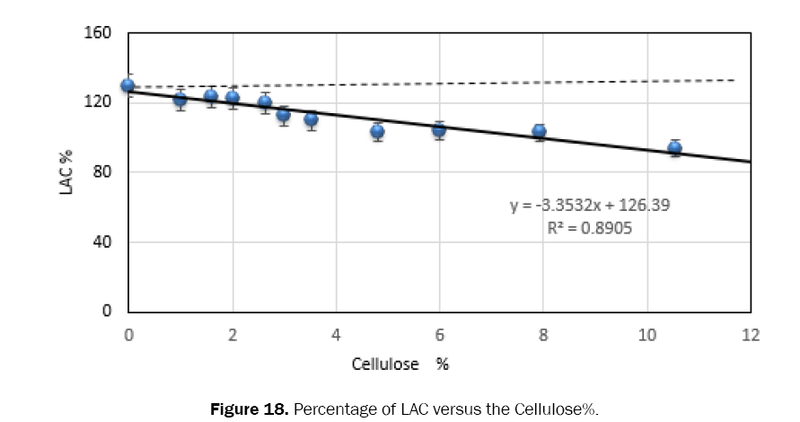 Figure 18: Percentage of LAC versus the Cellulose%. Figure 19 shows the amount of water loss of different fabrics dried at 22°C for 30 minutes. The result indicates that untreated sample absorbs less water and dry more quickly compared to treated cellulose sample. Figure 19: Liquid absorptive capacities LAC% of different fabrics dried at 22°C for 30 min. Polyester fabrics have many desirable properties, but it has some certain drawbacks such as low moisture regain, soiling problem, difficult to dyeing and pilling. Several methods are attempted to improve its water absorption properties. Modified types of textile fabrics of Polyester woven fabric, acquire good hydrophilic properties after being coated with cellulose with the low percentage. Hydrophilicity of modified fabrics was examined in terms of spreading area of water and wickability. It was found that there is an improvement in the wettability of the treated fabrics. SEM and FTIR measurements confirm the presence of cellulose layer and the hydroxyl group. The changes in physical performance of the coated fabrics were evaluated by determining bending force, porosity and air permeability. It was found that the increase in Cellulose% on the fabric surface leads to increase in the fabric stiffness and decrease of the air permeability, fabric treated with up to 6 of cellulose% has higher air permeability, low stiffness properties, and higher wetting properties. Prince A. Chemical modification of polyester [pet]. Fibre2Fashion Pvt. Ltd. India. Wavhal S and Balasubramanya R. Role of biotechnology in the treatment of polyester fabric. Indian J Microbiol 2011;51:117-123. Natarajan S and Jeyakodi Moses J. Surface modification of polyester fabric using polyvinyl alcohol in alkaline medium. Indian J Fibre Textile Res 2012;37:287. Ibrahim SM. Application of hydrophilic finished of synthetic fabrics coated with cmc/acrylic acid cured by electron beam irradiation in the removal of metal cations from aqueous solutions. J Appl Polym Sci 2010;117:3098-3106. Bendak A and El-Marsafi S. Effects of chemical modifications on polyester fibres. J Islamic Acad Sci 1991;4:275-284. Zaman M, et al. Hydrophilic modification of polyester fabric by applying nanocrystalline cellulose containing surface finish. Carbohyd Polym 2013;91:560-567. Zhang S, et al. Dissolution behaviour and solubility of cellulose in NaOH complex solution. Carbohyd Polym 2010;81:668-674. Shenai VA and NK N. Text Dyer Print 1981;14:25. Bendak A and Raslan W. Pretreatment of proteinic and synthetic fibres prior to dyeing: INTECH Open Access Publisher 2011. Achwal W and Habbu V. Simultaneous effect of light and perspiration on fastness of polyester/cotton dyeings. Man-Made Textiles in India 1986;29:286-91. Gibson PW, et al. Dynamic permeability of porous elastic fabrics. J Engineered Fabrics Fibers (JEFF) 2012;7. Militký J, et al. Influence of fabric construction on their porosity and air permeability. Proceedings of 2nd SIENTEX Conference “International Symposium of Textile Engineering; 2004. Ogulata RT and Mavruz S. Investigation of porosity and air permeability values of plain knitted fabrics. Res & Develop 2010;5:71-75. Berkalp OB. Air permeability & porosity in spun-laced fabrics. Fibres Textiles Eastern Eur. 2006;14:81. Epps H and Leonas K. The relationship between porosity and air permeability of woven textile fabrics. J Testing Evaluation 1997;25:108-113. Ogulata RT. Air permeability of woven fabrics. Journal of Textile and Apparel, Technol Manage 2006;5:1-10. Fridrichová L. A new method of measuring the bending rigidity of fabrics and its application to the determination of the their anisotropy. Textile Res J 2013:0040517512467133. Plaut R H. Formulas to determine fabric bending rigidity from simple tests. Textile Research Journal. 2014:0040517514553877. D'Silva A, et al. Concurrent determination of absorption and wickability of fabrics: A new test method. J Text Inst 2000;91:383-396. Hollies NR, et al. Water transport mechanisms in textile materials1 part i: The role of yarn roughness in capillary-type penetration. Text Res J 1956;26:829-835. Memariyan F and Ekhtiyari E. Study on wicking measurement in thin layer textiles by processing digital images. Int J Eng-Trans A: Basic 2009;23:101-110. Saville B. Physical testing of textiles: Elsevier 1999. Chaudhari SS, et al. Waterproof breathable active sports wear fabrics. Man-made Textiles in India. 2004;5:166-171. Alay S and Yilmaz D. An investigation of knitted fabric performances obtained from different natural and regenerated fibres. J Eng Sci Design 2010;1:91-95.